A few years ago, I found out from Owen Davies’ Grimoires that there was an English translation of an Icelandic grimoire. Having developed an interest in the Icelandic sagas and the curious magic in them, I meant to hunt the translation down to have a look, but never quite managed to do so. And then just last week I was hunting through the stacks at Harvard University’s library, and there it was! 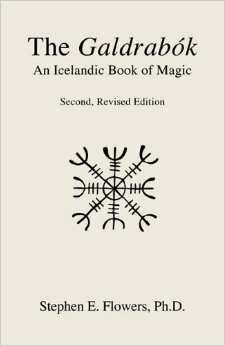 Stephen E. Flowers’ The Galdrabók: An Icelandic Book of Magic (second, revised edition, 2005) is a slim volume of about 100 pages, of which the actual grimoire, the Galdrabók, takes up only 17 pages. The rest is Flowers, offering background, footnotes, and related texts to help explain the contents and context of the grimoire. Sounds like a lot of explanation for so little text? You’ll need it. If anything, I find Flowers a bit too succinct in his “Historical Background” chapters, often leaving me with questions about the basis for some of his assertions. If you’ve been following this blog, you might remember my review of Stephen A. Mitchell’s Witchcraft and Magic in the Nordic Middle Ages. Now the Galdrabók dates from just after the period Mitchell covers, since it was compiled sometime after 1550, but Mitchell has two pertinent observations. Magic has to be practical: it is meant to do things people want done, and must be grounded in a world-view that makes the magic possible. Second, what was originally a pagan magic system was increasingly influenced by Christianity, forming a syncretism that is less a coherent system and more an agglomeration of elements from both. Both of these observations apply in full force to the Galdrabók. It is not a systematic exposition of magic. Instead, it is a collection of 47 spells that were assembled by four different compilers. They are practical spells: protecting one’s self against danger, detecting a thief, making a woman fall in love with you, and the like. (Yes, there is a spell to make your enemies fart. You just had to ask, didn’t you?) And the spells clearly include a mix of elements from pagan and Christian magical traditions. There are two distinctive features of the Galdrabók in comparison to the more Christian magic in such grimoires as the various Keys of Solomon. There are runes, of course. And the magic seems to work directly through the agency of the operator, as opposed to the operator summoning entities (usually demons or angels) to effect the task. Flowers makes both these points himself in his commentaries on the text. He also offers some general historical background on the development of religion and magic in Iceland, and explanations of the individual spells in the Galdrabók. Still, as I say, I found him a bit too succinct. It’s sometimes hard to tell whether Flowers is summing up a vast amount of information in brief, or offering a conclusion based on scanty evidence. Fortunately, the footnotes and bibliography suggest useful additional reading, though I must note that several works are in Icelandic (naturally) and other tongues. Flowers himself is apparently a practicing occultist, and the praise for this work on amazon.com mostly comes from others interesting in practicing rune magic. But whether you’re interested in practicing magic, or, like me, more interested in its anthropological and historical aspects, I’d suggest this book is more of an entry point into understanding Icelandic and Germanic magic, rather than a volume to stand on its own. This entry was posted in Reviews and tagged Galdrabok, grimoire, Iceland, Magic, review. Bookmark the permalink. Well, there are more to come — I have a backlog of books I’ve read since the beginning of autumn I’ve meant to post on. I hope they continue to meet your expectations! The staves are somewhat similar to a common design called the helm of awe, which is represented by a complex cross, and the wood in question is connected to the god Thor. Flowers relates this type of spell to those used by Egil in “Egil’s Saga,” when he carves runes into poles and drinking horns. I do get it! It is nteresting. In away, it’s not dissimilar to holding a cross to a vampire…It is the power of materialized symbols. Thanks! And of course, if you were armed with such a potent talisman, your bearing would be much more confident; causing at least confusion to the enemy!